Zynga has revealed the results of its fourth annual Valentine’s Day survey, which saw almost 70,000 Words with Friends players share how they express their love (and respond to romantic language) both in the real-world, and in the game. The survey identified users’ dating preferences, romantic faux pas and more, and found the number one turnoff for both men and women was a person’s overuse of a single word or phrase (for example, “like”). Poor grammar also kills the romantic spark for 25 percent of men and almost one third of women. When asked which words they’d like to see removed from our collective vocabularies, 43 percent of respondents said the pet name “bae” should be retired. “Boo” followed in second, with almost one third of respondents saying the name should be left behind. On the other hand, the word “shagging” took the top spot as a word users would like to see added to our everyday conversations. When it comes to dating behavior, the survey found 40 percent of millennial Words with Friends players have played the game while on a date. A large percentage of women (30 percent) don’t bring their phones on dates in the first place, while 25 percent of men said they have taken a mid-date selfie. Since the release of Words with Friends in 2009, nearly 1,000 people have found their “perfect match” within the game, and have gotten married, while tens of thousands of additional players have developed meaningful, lasting relationships through the game. Zynga says one in four of those players have taken their relationships beyond the game board and into the real-world. 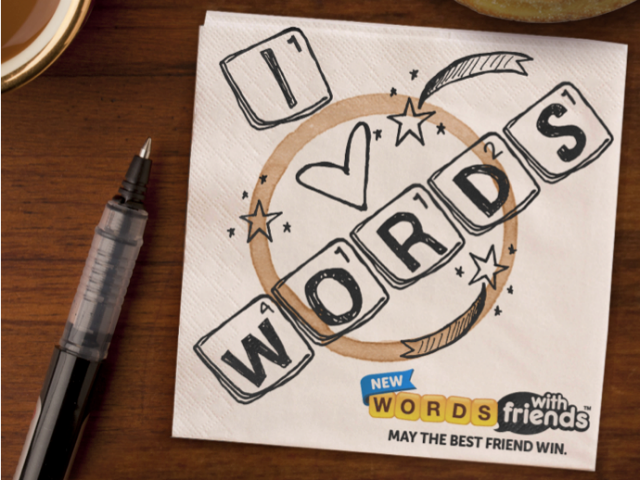 Words with Friends is available to download for free on mobile devices, and to play for free on Facebook. Check out Zynga’s full Valentine’s Day infographic below.